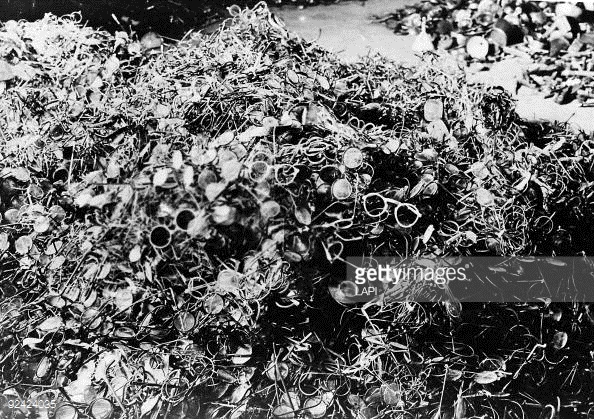 Mound of Glasses at Auschwitz, property of Getty Images. saved up for those craven or foolish. Some live happily ever after. A draft poem for Ella’s prompt on With Real Toads about Grimm’s Fairy Tales. I actually find Grimm’s Fairy Tales very interesting stories, but the originals are pretty grim, as is often noted. When thinking about the stories, I could not help also thinking about a war crimes trial going on right now in Germany of a man who was a former guard and bookkeeper at Auschwitz, charged as an accessory in 30,000 deaths, and a recent article that I read concerning those people who work as preservationists at Auschwitz. (Apparently, one is not now allowed to take photos of the mounds of hair that were found at the camp on its liberation. At that time, there were 7000 kg of hair, which was a small fraction of the hair actually collected.) The preservationists have (in my view) a sacred, if very difficult, task. This entry was posted on April 24, 2015 at 11:03 pm and is filed under news, poetry. You can subscribe via RSS 2.0 feed to this post's comments. What a chilling reminder .. And its there is important, soon all perpetrators and survivors are dead, so now only those objects remain. An important work indeed. No smiles in this courtroom. None from your readers either. Gloom throughout. Fitting the shoe would be a bloody scene. Nice writing, it must hVe been hard to keep the dark mood. Yes, Grimm’s stories are pretty horrific really, at least in the original. And so are some of the things real humans do to each other. I think you are making some very good points here, and would be interested to see where this draft goes in the end. Blood-chilling..! Agreed with Jim.. this is seriously dark stuff & it must have been difficult keeping up with the mood! You’re right, the original fairy tales are very dark and violent. What an original approach to entwine that with the war crimes trial. Brilliant! Fairy tales and blood and terror. Well done. It is no accident that Bruno Bettleheim finished thinking through “The uses of enchantment” in concentration camps. Whatever else he might have done, he opened that door. Because of being raised on these stories, your poem is extra meaningful to me! A somber topic, so easily overlooked amid our current whirl of other disasters, yet I think no one who grew up in the post WWII generations can ever completely forget or ignore it. Your poem mixes the grotesque with the heart-rending, the pain with a sort of anesthetized obliviousness in a very deft and effective way. I also watched a bit of this trial footage, thinking no one who was a cog in that machine is without responsibility. When you accept the dictums of monsters, you become one yourself. The Grimmest tale of all and too sadly true. Yes, the preservationists have a sacred task. Your line “I knew…but didnt do….” hits home. Human history is nothing if not a trail of human hair, bone and blood stretching back much further than 70 years and genocide is being practiced as we speak in more than one place on the globe. I wish that the trial of one man would be sufficient to bring it all to an end but it seems such a drop in the ocean. I just love the way you connected all these loose ends into a beautiful poem. Thanks.